On Thursday March 16th Canada Goose Holdings Inc., producer of stylish $900 parkas, surged in its debut as publicly traded company on the New York Stock Exchange (NYSE) and on the Toronto Stock Exchange (TSX). Shares closed the first day of trading in Toronto at C$21.53, up almost 27 percent relative to the IPO price of C$17, which was already above the initial expected range of C$14 to C$16, hence giving Canada Goose a market value of about C$2.3 billion ($1.72 billion). The significant first-day gain marked the second biggest IPO debut in 2017 following only Snap’s 44 percent gain on its first day of trading earlier this month. Furthermore, as Bloomberg Intelligence analyst Maja Rakic wrote in a note, that valuation would attribute Canada Goose a price-to earnings multiple of 45.5x, using conservative growth estimates, which is the highest compared to any other luxury retailer in the world. Timing seemed to be on the side of Canada Goose. Equity markets were climbing to new record highs and, on top of that, New York could not have provided a better backdrop for the company’ IPO: Winter Storm Stella ploughed across the East Coast, bringing several inches of snow and below-freezing conditions for which the retailer’s parkas are made. Did that actually matter? Some like David Soberman, professor of marketing at the University of Toronto, is convinced that yes, it mattered, saying “It’s a company that is doing very well and is visible at this time of the year. If it were really sunny out, I’m not sure it would be doing so well”. In addition, Canada Goose, founded only 60 years ago, has been taking off since 2013 when Bain Capital took a 70 percent stake in the company. Since then, the firm has become a very recognized and popular brand in fashion and among celebrities, from Toronto rapper Drake to Blue Jays fighter John Bautista. Now, in 2017 Canada Goose is therefore just at the beginning of its growth trajectory as opposed to other few brands like SoulCycle, for example, that really missed their window and are now struggling. This is what really encourages investors. Such a high valuation relative to other peers, however, does not definitely come without concerns. In the first instance, very high valuations are renowned for setting market expectations very high as well. According to some investors, one of the biggest reasons for this strong motive to invest in Canada Goose has been the steady growth in revenues of about 37 percent per year over the last three years. Nevertheless, those same investors will expect this pace to continue also in the future and this would force the company to expand in new global markets beyond North America (USA and Canada), where currently two thirds of its total revenues are generated. In conclusion, Canada Goose will also need to deal with animal-right activists. A routine protest of the company’s use of fur has not been factored into the IPO, which was certainly a great success. Yet this event could make the firm an even bigger protest target and that could actually matter for the future of the newly public company. The business model behind the luxurious parkas might be relatively impervious to activists. 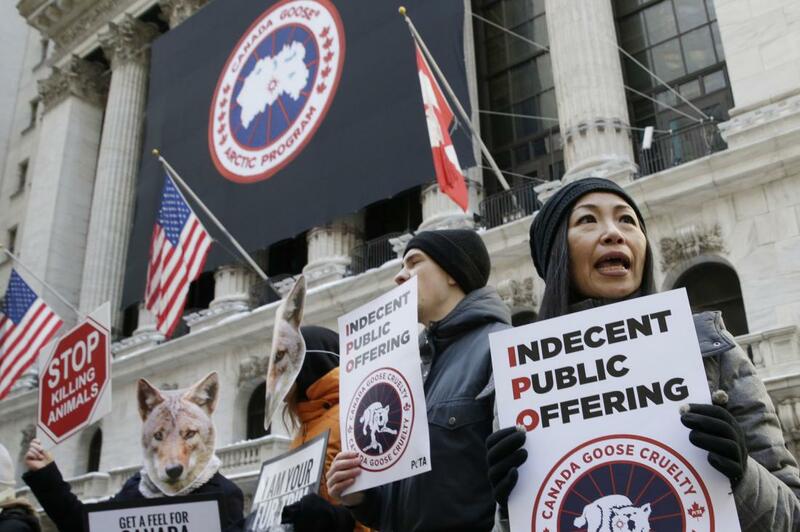 However, no company enjoys ugly scenes in front of its stores, and the potential alienation of celebrities who helped in building up the brand surely poses a substantial threat to Canada Goose.